It's odd. Out of all the William Faulkner novels you would consider to take to the screen, The Sound and the Fury might well be bottom of the list. Strangely, I have fancifully fantasised about my own adaptation. As it happens, James Franco's adaptation is already in production. He beat me to it. How can a book you have to read twice to understand make a good film? Literary novels, on the whole, generally make poor films. Literary conceits/devices are difficult to emulate. It is usually the pulpier books which improve on the screen. It is only when you get an auteur who is equally brilliant on his own right - think of Stanley Kubrick, David Cronenberg and Vittorio de Sica - that the film can make its source justice. I am not too convinced Franco - incidentally, I hardly knew anything about him before - has the pedigree to see this through. It would seem that the only natural thing to do would be a linear recreation. Apparently, the 1959 adaptation did just that. The plight of the decadent Compson family, who find their fortune and emincence turned on its head, is a universal theme. It shares parallels with Orson Welles' masterful The Magnificent Ambersons. Whilst the book's technique is literary, the themes can easily be transplanted into the big screen. Not to mention, the book has startling images that leave an indelible dent on the mind of the reader. The book germinated with a mental image Faulkner had of an innocent dread-locked girl dangling from a tree, with her brothers gazing from below. He called it an image of 'purity.' From there developed the conflicted, even incestual, relationship all three Compson brothers have with their sister. Similarly, there are images of Benjy screaming which would make stellar cinematic moments. When he clings to a fence, inarticulately beseeching his sister to return. The ending of the book, where he screams with all his force has the potential to become on the most searing endings of the history of cinema. They are very loaded moments which are not that difficult to dramatise. They hark back to Shakespeare's phrase, the novel's namesake, 'Life is a tale told by an idiot, full of sound and fury, signifying nothing'. The opening chapter, narrated by the mentally impaired Benjy, has a cinematic quality of a montage reminiscent of Terrence Malick. Yet one of the most distinctive aspects of the chapter is that it is about Benjy's defamiliarising and idiosyncratic language. There are a number of oxymorons and tautologies which characterise his unusual perceptual process. For instance, he repeatedly describes the smell of colours. The use of a voice over would never work, namely because Benjy cannot speak. The second chapter is the most difficult of all. Again, Faulkner uses language very in a very specific way, this time recreating a mental breakdown through disintegrating syntax. Most importantly, the chapter is pretty much a treatise on the nature of metaphysical time and the decline of social patriarchies. There also a series of ruminations about his family. You cannot dramatise any of that. If he were to discuss these themes with his peer Shreve, it would feel stagy. There are a sequence of images of Quentin with an errant child which would work well cinematically, but placed after a delirous Malick-like montage it would turn the film into a cluttered mess. I think that this chapter would make a good film in its own right if it were treated in an austere way. We could follow Quentin introspecting, travelling on a train, the recurrence of ticking clocks, etc. The third chapter I guess is less problematic than the two chapters above. Following Jason in his perambulations would work well, I guess. Yet, once again, the chapter is very subjective. Jason's unlikeable traits are as much evinced by his razor-sharp language as they are by his actions. The fourth chapter is the most cinematic. I already described how well the ending would well. One of the most pivotal roles of this chapter is that it ties all everything together. Everything coheres in the end and you return to the preceding chapters until everything makes sense. A film would struggle to pull that off because most of the ambiguities and asperities the reader encounters beforehand are to do with Faulkner's opaque language. The ending in the film would not resolve everything, it would just make matters more confusing. Yet I would certainly attend a screening of this whenever it comes out. 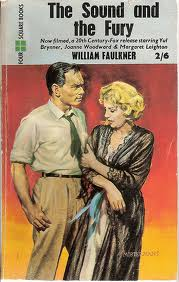 Faulkner is my favourite writer and it would be intriguing to see these neurotic, brooding characters on screen. Yes. I have often dreamed of an adaptation of TSatF. One would have to approach it a la Marker or Resnais, with a heavy scoop of dramatic force. I'm not sure Franco can pull this off. From what I saw of his As I Lay Dying adaptation, I'm even more skeptical whether or not he possesses the powers necessary to adapt Faulkner. Most importantly, there cannot be well-known faces appearing in Jefferson, Miss.